Yellow straw color. Bright, baked aromas and flavors of roasted mangos and papayas, coconut water, and tapioca with a silky, crisp, sourish light-to-medium body and a short finish that presents notes of overripe melon, bruised green apple, and grassy earth with crunchy, fruit tannins. 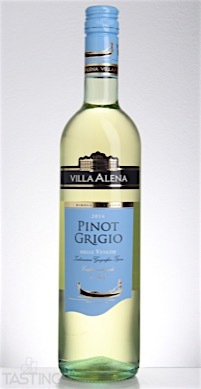 Villa Alena 2014 Pinot Grigio, Delle Venezie IGT rating was calculated by tastings.com to be 82 points out of 100 on 3/3/2016. Please note that MSRP may have changed since the date of our review.